Closed herringbone is a variety of herringbone where the stitch is worked so closely together that it forms a line of crossed stitches. On the back of the fabric it will show a two lines of back stitches so it is also known as Double Backstitch. Another use for this stitch is to work it on sheer or semi sheer fabric to create a style of very subtle and interesting type of embroidery called shadow work. Normally with forms of herringbone stitch you would work the crosses on the front of the embroidery as a surface stitch but in shadow work you work the stitch on the back and it shows through the fabric. This means the shadow of the work is seen hence the name. When worked in shadow work Closed Herringbone is known as Shadow stitch. But you can also use closed herringbone as surface stitch too. It is very useful to define a good strong line or in a border or as part of an edging. This stitch is worked from left to right between two lines. Commence by bringing the needle out on the bottom left-hand side of the line to be worked. Take the needle up and make a small stitch on the upper line which points to the left, pull the thread through. Insert the needle on the lower line but have the needle tip emerge in line with the edge of the edge of the upper stitch (as illustrated) and make a small stitch which points to the left. Insert the needle on the upper line a little to the right and make a small stitch which points to the left. Have the needle emerge next to the previous stitch. Continue in the manner along the line working each herringbone stitch closely so that is sits right next to the previous stitch. At last my closed herringbone stitch design has progressed enough to be posted. My sampler looks rich covered in all the thread that the Closed Herringbone requires. 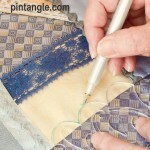 I’ve just posted a photo of my closed herringbone stitching on Flickr and added it to our group. 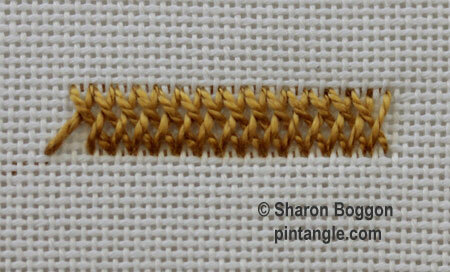 The moment I saw this stitch I knew what I would stitch which is surprising as I use it all the time in shadow work. I’m still struggling with the woven chain but I will get there. I look forward to trying the Closed Herringbone! 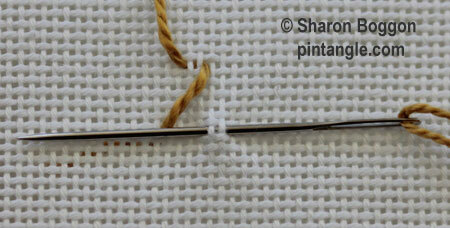 This week, I have two simple stitches to share – 14: Stem stitch and 15: French Knot. Great! These Herringbone stitches are so close, even I won’t have a problem putting the needle into the right hole.